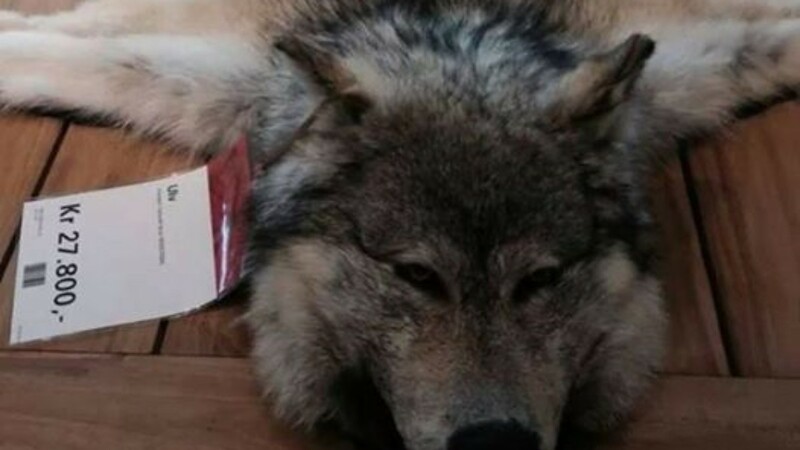 This wolf skin in a furniture store in the town of Hokksund made ​​many customers furious. It was not the 27,800 kroner price (4634 dollars) that made people react, but the fact that it was presented for sale. – Before the weekend, I and my son went to buy a dresser. On a dining table by the store door was a full head wolf skin on a table. We were devastated and had to ask the staff if it was real, says Silje Storm Fredriksen to VG.no. The staff confirmed that both fur and head were 100 percent genuine. During the visit, Storm Fredriksen took an image that was later posted on the Facebook group “Bygdefolk for rovdyr ” (English:Rural People Supporting Predators). After the image was published, Store Manager Ruben Amundsen saw no alternative but to remove the wolf skin from the store. – There has been an enormous response. It came as a complete surprise, he says to TV2. There are strong emotions involved when it comes to the issue of wolf conservation and management in Norway, and the population consists of only 30 animals. On one side of the conflict you will find farmers who claim that wolves are one of the biggest threats to grazing livestock. On the other side animal protectionists who say that wolves are endangered and who believe that the farmers themselves should take responsibility for their livestock. The Store Manager says he is sorry if anyone feels offended and stresses that it only was his store in Hokksund that offered the wolf skin. He describes himself as an animal friend and says that the wolf is killed legally in Canada, which he can document. – I thought this was okay. Everything is done legally, but the skin will never be sold. It is removed, he says. Silje Storm Fredriksen tells Norwegian Broadcasting Corporation that she is glad that the wolf skin is removed from the store. – I did not expect such a big response. But this shows that it gives results when you speak up. ‹ Did the Vikings Use Telescopes? Wolf numbers are very healthy in Canada and in many areas overpopulated. In order to protect healthy wolf populations and other threatened species, like several populations of caribou, wolves must be culled. Canada has over 60,000 wolves, which are legally considered a big game species, though they are afforded protection in 3% of Canada’s territory. The Northwest Territories, Nunavut and Yukon have 5,000 wolves each, British Columbia has 8,500 wolves, Alberta 4,200, Saskatchewan 4,300, Manitoba 4,000-6,000, Ontario 9,000, Quebec 5,000 and Labrador 2,000. Canada currently has no livestock damage compensation programmes. In the fall of 2012, the government of British Columbia was considering a cull of the wolf population in some areas. In the winter of 2015 the government of British Columbia began undertaking a cull of up to 184 wolves in an effort to combat dwindling caribou populations in the South Selkirk Mountains and the South Peace region. The cull, like ones before it, is opposed by some environmental groups. On 12 March 2012, a grey wolf, mistakenly thought to be a coyote, was shot on Newfoundland. It was the first confirmed grey wolf on Newfoundland since ca. 1930. Hi Andrew, and thank you for your reply! Interesting facts.